Probably the simplest way to build a geodesic dome frame, all you do is flatten the end of some metal tubing bend it slightly then drill a hole. Do this to both ends get yourself a bag of bolts and you can easily build a dome framework in a day. Used for burning man, climbing frames and other small projects. Advantages: Really easy to build, easily assembled/disassembled, no special tools required, just make sure you don''t split the tube when you flatten it and that you flatten enough so you can put the bend in without interfering with other struts. Disadvantages: Quite crude, can only be covered with material because joints don''t finish level. Another simple construction technique, slightly more work than the flattened conduit method but is a more professional and flexible system. Instead of joining the struts directly together a larger diameter pipe is used as a hub holes are drilled through the hub and the struts are bolted to it. Advantages: Makes a nice neat job with all struts finishing level while still being cheap and easy to build. Disadvantages: Great for material covers but there is no easy way to fix a hard covering material. Wooden beams are attached to specially made hubs to form the dome framework; the angles are taken care of by the hubs so all you have to do is cut the beams to the correct length. More expensive to build than a tube type framework but makes a solid permanent dome. Advantages: Simple dome construction system that doesn''t require specialist tools or knowledge to build. Disadvantages: The hubs can be expensive and hard to find because they have to be specially made. When the beams have board nailed on both sides there is no way to ventilate the void between, in a heated dome this can lead to damp, dry rot and a number of other problems. This system uses wooden beams but instead of metal hubs at the joints panels are made that join at the edges and have the outside material attached (usually plywood). These panels are factory made so all you have to do is nail them together in the correct order to build a dome. Advantages: Simple and extremely fast way to build a permanent dome structure. Disadvantages: Because the panels are factory made you don''t get much design choice. Ventilation problems can occur when material is fixed to both sides. Metal or fibreglass panels are bolted/riveted together to form the dome, there are no beams, hubs or separate support structure the skin does everything. 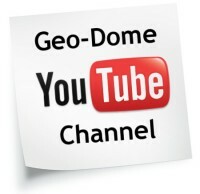 Advantages: Probably the most cost effective and efficient way to build a dome. Some simple fabrication is required but this can be easily sourced locally. Disadvantages: Metal sweats when it gets cold so some form of insulation has to be glued to the inside of the panels to prevent condensation forming. Cutting holes for doors and windows can seriously weaken the dome structure. There are basically three stages involved in building a monolithic dome: First an airform membrane made from PVC is inflated on the site were the dome is to be built; this acts as the out weatherproof skin on the finished dome. Next the inside is sprayed with polyurethane foam to insulate the structure; reinforcing bar is fixed to the foam ready for the next stage. Finally a concrete mix is sprayed on top of the urethane to finish. Advantages: Very strong efficient structure requiring very little in the way of heating/cooling. Disadvantages: The outer airform that acts as a weatherproof membrane can be damaged easily allowing water into the insulation layer. Both the PVC airform and the urethane foam insulation are oil based chemical materials, which are not that environmentally friendly. Most monolithic domes require dehumidifiers or heat exchange systems due to the fact that they are so airtight. Building domes using space frame is actually quite simple, the struts are made from solid bar and they are connected together with solid balls that have fixing points machined into them. Very commonly seen at airports and exhibition halls. Too expensive for the DIY builder but still interesting, the Eden project was built using a space frame. This building method dates back hundreds of years and was also used to build arches, bridges etc. A wooden former is made to the shape required then stone, brick, or concrete is laid on top of the former to produce the final dome shape. The former is used to hold the brick, stone or concrete in place until it sets and is able to support its own weight. Usually the former is removed but there is no reason why it couldn''t be left in place. Advantages: Makes a very strong long lasting dome that can be built using reclaimed materials. Disadvantages: A lot of expense is involved in making the former that MUST support the whole weight of the dome when the dome is finished the former becomes redundant. 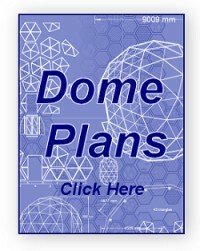 Building very large domes is not cost effective using this system. This method uses polystyrene foam or urethane foam as a former. Cut and glue the foam together to form the dome shape. Next tie chicken wire over the foam to act as reinforcing mesh. Finally apply a thin layer of cement render over the whole structure to weatherproof and finish the dome. Disadvantages: Only suitable for very small domes. Good basic stuff, but I didn't see any comments about building up a frame from thin wood, using glue between the thin wood members into a very round, geodesic frame. With overlapping thin wood parts, one could get around most hub ideas, or build one into the join (like plywood) as more thin wood was glued to the frame joints. Sort of like a build up of old timber frame ideas, and joints, but into a geodesic pattern. The primary difference is the thin wood parts glue up into arc parts, rather then flat parts trying to suggest a curve. The same general idea is used for arch framed greenhouses were 3/4" (or thinner) wood is bent from the bottom wood frame to a top centered beam. At first the top centered beam is attached to the bottom (foundation) frame by standard straight wood, as if making a simple triangle. Then the bent (thin) wood bows to form an arch. For a half (or less) sphere design (as in geodesic), you bow a lot of thin parts to round things up. This would require some sort of thin plywood, or other flexible "skin" to cover the round frame, unless you are thinking plastic sheet for a tent, or greenhouse. I am building a doom using the 'stressed skin' with reclaimed metal. What material should be used as insulation so the metal will not sweat when it gets cold? 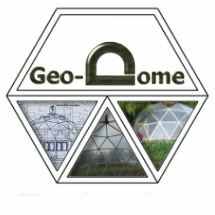 I have been interested in Dome construction for a humanitarian project and was looking for the cheapest most energy efficient method of construction, something that doesn�t require a massive amount of industry. My research has led me to the Earthbag techniques but I don't see anything mentioned here about Earthbag domes. Earthen domes are the oldest form of dome construction around. I wonder in today�s world if this is still applicable? That is considering the many other methods available. Hi. I'm interested in building some domes and I'm having a hard time finding the necessary angles for 3v, 4v, 5v, etc... domes. I'm fairly smart but not a math whiz and all I've found are math sites that show complex ways to find the angles between the struts. Does anyone hae a link where these things are already calculated? I just want to build the thing, not become a 3 dimensional geometry professor lol. I've done the math thing in Java for domes of any frequency based on any platonic solid and projected onto a couple of profiles including super-ellipsoidal and parabolic. Input is an XML description of the dome and it produces dxf files and part lists with most of the angles. It doesn't yet do hub angles and that would take a few days work. Thing is I lost interest in it before I could hook it up to an easy-to-use front-end, which is a shame because it's next to useless without that. You're welcome to it if you think you could make something of it. Hi Tim Use the Dome Calculator to give you the strut lengths of two domes. The difference in radius should be the size of your material. On the Monolithic Dome. The potential damage to the outer skin has been a question in my mind also. Why couldn't you spray a layer of lightweight concrete on the outside also?